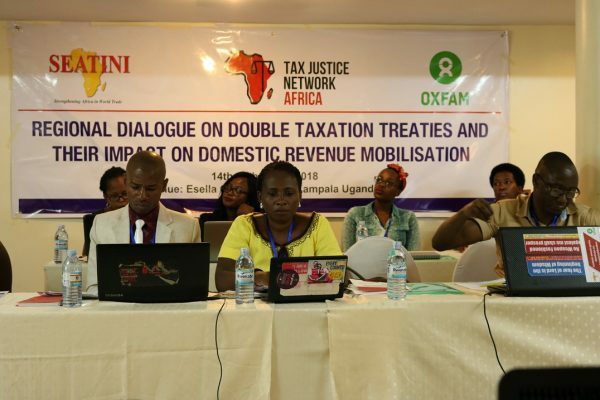 SEATINI Uganda, OXFAM in Uganda and Tax Justice Network Africa organized a Regional Meeting to discuss “Double Taxation Treaties and their Implications on financing for development in Africa”. The meeting took place in Kampala, Uganda on on March 14th and 15th 2018 and included Partners from the Scaling up Tax Justice (SCUT) project and Civil Society Organizations working on tax justice and related issues in the East Africa region. As part of the Scaling up Tax Justice Project, the countries of Uganda, Zambia, Nigeria, Tanzania and Ghana, in partnership with Tax Justice Network Africa (TJNA), commissioned joint studies on the Implications of Double Taxation Treaties (DTTs) in Financing Development in Africa. This is a follow up on the work done in various countries by CSOs, like SEATINI Uganda and ActionAid Uganda, TJNA, Econews, Center for Trade Policy and Development (CTPD) and the litigation work done in Kenya on the DTT between Kenya and Mauritius. The meeting discussed and analyzed comparative findings on the studies that have been conducted within the different countries, highlighted lessons from various countries and how to address the gaps in the Double Taxation Treaties and finally discussed joint advocacy on key Regional DTA issues. Different Double Taxation Agreements were compared and it was concluded that there should be an emphasis on advocacy for DTAs that contribute to domestic revenue on the continent.